Background : In 2010 the COPD Foundation established the COPD Biomarkers Qualification Consortium (CBQC) as a partnership between the Foundation, the Food and Drug Administration (FDA), and the pharmaceutical industry to pool publicly-funded and industry data to develop innovative tools to facilitate the development and approval of new therapies for COPD. We present data from the initial project seeking regulatory qualification of fibrinogen as a biomarker for the stratification of COPD patients into clinical trials. Methods: This analysis pooled data from 4 publicly-funded studies and 1 industry study into a common database resulting in 6376 individuals with spirometric evidence of COPD. We used a threshold of 350 mg/dL to determine high vs. low fibrinogen, and determined the subsequent risk of hospitalizations from exacerbations and death using Cox proportional hazards models. Results: High fibrinogen levels at baseline were present in 2853 (44.7%) of individuals with COPD. High fibrinogen was associated with an increased risk of hospitalized COPD exacerbations within 12 months (hazard ratio [HR]: 1.64; 95% confidence interval [CI]: 1.39–1.93) among participants in the Atherosclerosis Risk in Communities Study (ARIC), the Cardiovascular Health Study (CHS), and the Evaluation of COPD Longitudinally to Identify Predictive Surrogate Endpoints (ECLIPSE) study. High fibrinogen was associated with an increased risk of death within 36 months (HR: 1.94; 95% CI: 1.62–2.31) among all participants. Conclusions: Fibrinogen levels ≥ 350 mg/dL identify COPD individuals at an increased risk of exacerbations and death and could be a useful biomarker for enriching clinical trials in the COPD population. Funding Support: Sponsored by the COPD Foundation, COPD Biomarker Qualification Consortium (CBQC), with funding provided by AstraZeneca, Boehringer-Ingelheim, GlaxoSmithKline, Novartis, and Pfizer. Effort for RGB provided by National Institutes of Health/National Heart, Lung and Blood Institute HL077612. Approved pharmacological treatments for COPD are targeted primarily to the relief of respiratory symptoms (i.e., improve airflow) and the prevention and reduction of COPD exacerbations. For clinical trials that specify exacerbations and/or mortality as key outcomes, it is important that the study sample be composed of individuals who are likely to have the event(s) of interest during the duration of the trial. Currently, the selection of participants for inclusion in such studies relies primarily on clinical characteristics (e.g., individuals with respiratory symptoms and/or a history of COPD exacerbations). Yet, in most clinical trials of COPD patients, a high percentage of enrolled participants do not manifest the events of interest over the course of the study period. Additional patient characteristics that help to optimize the enrollment of participants would increase clinical trial efficiency and reduce the costs of COPD clinical trials by reducing the number of participants needed and the study duration. These patient characteristics can be thought of as biomarkers. The identification of biomarkers would therefore minimize the exposure of a relevant patient population to investigational medicines prior to at least some determination of their safety and effectiveness. In 2010 the COPD Foundation established the COPD Biomarkers Qualification Consortium (CBQC) as a partnership between the Foundation, the U.S. Food and Drug Administration (FDA), and the pharmaceutical industry to pool publicly-funded and industry data to facilitate the development and approval of new therapies for COPD.10 The benefit of combining data from multiple studies and trials is the ability to demonstrate that a factor such as fibrinogen has consistent outcomes in different populations, adding to the robustness of this as a predictive factor. We present data from the initial project seeking approval of fibrinogen, a measure of inflammation, as a biomarker for the enrollment and stratification of patients in clinical trials. The full Qualification Package submitted to the FDA is available in the online supplement. The CBQC created an integrated database at the participant level from 5 individual studies. Additional studies were considered but excluded based on the age of the population, difficulty in obtaining patient-level data, or missing key data (i.e., fibrinogen levels). The studies included are described in more detail below. All variables included in the integrated database have been coded into a common format according to Study Data Tabulation Model (SDTM) guidelines to allow the database to support integrated analyses pooled at the participant level. SDTM standards were implemented to map legacy participant level datasets to SDTM standard datasets. For consistency, data handling and mapping rules were defined prior to conversion programming. Statistical Analysis Systems (SAS) programs were developed to generate SDTM standard datasets for the individual studies to produce the integrated dataset. The National Health and Nutrition Examination Survey III (NHANES III)11: NHANES III was conducted from 1988 to 1994 by the National Center for Health Statistics (NCHS) of the Center for Disease Control and Prevention (NCHS 1996). NHANES III is a general population-based study and is a representative sample of the U.S. civilian population. Plasma fibrinogen concentration and spirometry (pre-bronchodilator) data are available from 8342 adults aged 40 years and above. Follow-up data were provided by the NCHS by linking the participants to decedents in the National Death Index in 2006. Framingham Heart Study Offspring Cohort (FHSOC)12: The Framingham Heart Study Offspring Cohort was initiated in 1971. Over the ensuing decades, several follow-up examinations were conducted. The cohort initially consisted of 5124 participants (all participants were offspring or spouses of offspring of participants in the original FHS). Plasma fibrinogen and pre-bronchodilator spirometry were collected beginning with evaluation visit 5 of the Offspring Cohort study with follow-up hospitalization and vital status information available for a 25-year period. Cardiovascular Health Study (CHS)13: CHS was initiated in 1988 and is a general population-based study of U.S. participants aged 65 years and older. The original CHS cohort comprised 5201 participants recruited from 4 communities: Forsyth County, North Carolina; Pittsburgh, Pennsylvania; Sacramento County, California; and Washington County, Maryland. Plasma fibrinogen and pre-bronchodilator spirometry were assessed at the baseline visit. Atherosclerosis Risk in Communities (ARIC) Study14: ARIC is a U.S. general population-based study begun in 1987. The study recruited 15,792 participants in 4 communities: Forsyth County, North Carolina; Minneapolis, Minnesota; Washington County, Maryland; and Jackson, Mississippi. Plasma fibrinogen and pre-bronchodilator spirometry were collected at baseline. 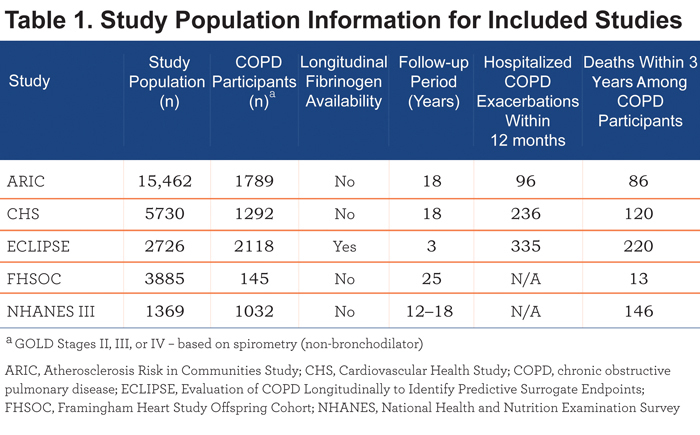 Evaluation of COPD Longitudinally to Identify Predictive Surrogate Endpoints (ECLIPSE)15: ECLIPSE is a 3-year prospective, observational study conducted in 46 sites in 12 countries. The ECLIPSE cohort included 2164 COPD participants with moderate to very severe airflow limitation (Global initiative for chronic Obstructive Lung Disease [GOLD] stages II, III, and IV) along with smoking and non-smoking control groups. Only the patients with COPD were included in the analyses described here. Plasma fibrinogen was measured at baseline and longitudinally during the 3 years of ECLIPSE. Patients eligible for inclusion were aged 40 years or older and met the criteria for moderate, severe, or very severe COPD described below. Table 1 provides general descriptive information for the 5 studies included in the integrated database. A detailed description and discussion of the characteristics of the study populations and the integrated database is included in the Results section. COPD was defined spirometrically according to a modification (based on pre-bronchodilator lung function) of the GOLD classification,16 i.e., forced expiratory volume in 1 second (FEV1)/forced vital capacity (FVC) < 0.7 and an FEV1 < 80% of predicted. Where analyses included disease severity, the GOLD classification of the severity of airflow limitation was used. For the NHANES III, CHS, ARIC, and FHSOC studies, spirometry measurements were obtained without the use of a bronchodilator. In the ECLIPSE study both pre- and post-bronchodilator spirometry were obtained. For uniformity, pre-bronchodilator lung function was used with all participants to classify severity. For the mortality endpoint, all-cause mortality was used. COPD exacerbations for all studies, with the exception of ECLIPSE, were defined by hospital discharge diagnoses, including International Classification of Diseases, Ninth Edition (ICD-9) codes 490, 491, 492 and 496 extracted from hospital records and all other information available from hospital records. For the ECLIPSE study, COPD exacerbation information (non-hospitalized/moderate and hospitalized/severe exacerbations) was captured for each reported event during the study. Relevant time points for study outcomes of interest (e.g., 12 months for hospitalized COPD exacerbations and 36 months for all-cause mortality) were chosen to simulate the potential duration of clinical trials with these outcomes (e.g., most clinical trials of exacerbations run for 12 months and most trials for mortality run for at least 36 months). Two different methods were used to determine fibrinogen levels: the Clauss method that determines thrombin-clottable protein in plasma samples and direct methods that measure immunoreactive fibrinogen protein. Clauss-based methods were used in 4 studies ( the ARIC, the CHS, the FHSOC, the NHANES III), while an immunologic method was used in the ECLIPSE study.17 Using the performance criteria available, the intra- and inter-assay variability is similar across the methods. Based on data provided by the manufacturer of the assay used in the ECLIPSE study (Pacific Biometrics Inc.), plasma fibrinogen values reported in ECLIPSE have been adjusted by -13.6% to account for the type of plasma used in the analysis (ethylenediaminetetraacetic acid [EDTA] vs. citrate plasma) and to permit the comparability of these data to fibrinogen values reported in the other included studies. The relationships between plasma fibrinogen concentration, potential covariates, and COPD outcomes were tested in several ways. First, the crude relationship of plasma fibrinogen concentration to the risk of COPD outcomes was tested with a logistic regression model, with the presence of mortality or at least 1 hospitalized COPD exacerbation as the dependent variable. After the crude relationship between fibrinogen and COPD exacerbations was described, univariate analyses were performed to assess the relationship between covariates and the outcomes of interest. Clinically-relevant characteristics that were available in each study were eligible for inclusion in the models. Cox proportional hazards models were used to present the association between fibrinogen and COPD outcomes, after adjustment for the effects of relevant covariates (results available in the online supplement). Kaplan-Meier curves were also used to present the time to COPD outcomes in the integrated dataset and individual studies. Several different thresholds were tested (250 mg/dL , 300 mg/dL , 350 mg/dL , 400 mg/dL). 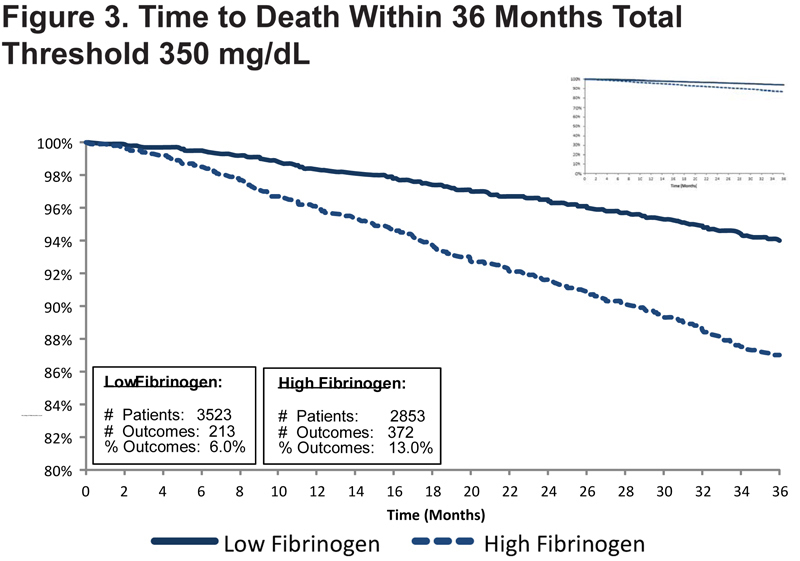 We present here findings for the 350 mg/dL threshold, a fibrinogen level which appears to maximize the benefit of identifying patients at increased risk for outcomes and minimize the cost of enrollment of patients with higher levels of fibrinogen. As institutions may wish to choose a separate fibrinogen threshold, data for the other thresholds are available in the online supplement. A total of 6376 patients met all inclusion criteria and were included in the integrated study database. Among the 5 studies analyzed, the baseline COPD sample varied with respect to the reported median age (range: 46.0 years in the FHSOC study to 71.5 years in the CHS study), race (range: 77.6% white in the NHANES to 97.7% white in the ECLIPSE study), and smoking status; gender distribution, however, was similar across all studies. The FHSOC did not provide data on the race or ethnicity of their study participants. In the integrated dataset, 61.6% of COPD individuals were men. Some of the diversity in participant characteristics is attributable to the different study designs, as the ARIC, CHS, NHANES and FHSOC studies recruited individuals from the general population, and the ECLIPSE study recruited individuals from specialist centers who conduct clinical intervention studies in COPD. 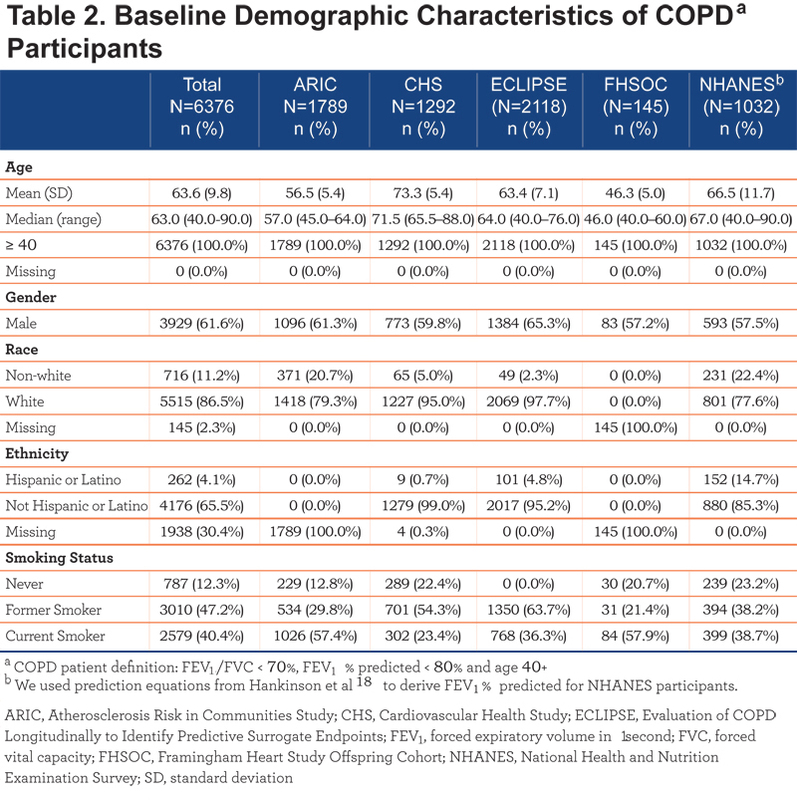 All COPD individuals in the ECLIPSE cohort were either current or former smokers, whereas the percentage of never smokers ranged from 12.8% in ARIC to 23.2% in the NHANES. Complete details of baseline participant demographics are provided in Table 2. COPD participants were similar at baseline with respect to their reported weight (pooled mean: 75.6±16.8 kg), height (pooled mean: 169.1±9.2 cm), body mass index (BMI) (pooled mean: 26.5±5.1 kg/m²), and heart rate (pooled mean 73.1±13.0 beats per minute) across the 5 studies. Information on baseline heart rate was reported only for NHANES and baseline oxygen saturation was reported only for the ECLIPSE study. Baseline laboratory values for cholesterol and C-reactive protein levels were also comparable across studies. Complete details of clinical characteristics of each cohort at baseline are provided in Table 3. The pooled mean baseline fibrinogen level was 351.7 ± 89.3 mg/dL among COPD participants included in the integrated dataset. Among the individual studies, participants in ECLIPSE reported the highest mean fibrinogen level of 397.3±91.9 mg/dL (while the study population from the ARIC study had the lowest mean fibrinogen, at a level of 322.2±74.3 mg/dL). Less than 10% of participants in the integrated dataset had a baseline fibrinogen level <250 mg/dL, while approximately 25% of participants had a baseline fibrinogen level of ≥400 mg/dL. Further details on baseline fibrinogen levels are detailed in Table 4. The ratio of FEV1/FVC (%) ranged from 44.2±11.1, as reported in ECLIPSE to a high of 60.9±9.1 recorded in FHSOC participants. The pooled mean of FEV1/FVC was 53.7±12.2 across the 5 studies. The mean FEV1 % predicted at baseline was lowest in ECLIPSE (43.8%) and highest among COPD participants in the ARIC study (63.8%). Hospitalized exacerbations occurring within 12 months were reported for the ARIC, CHS, and ECLIPSE studies (hospitalization data were not available for NHANES and FHSOC) with 10.5% of participants reporting this outcome within 12 months among the 3 studies. The proportion of participants with hospitalized exacerbations within 12 months was highest in the CHS (18.3%) and lowest in the ARIC study (5.4%). The pooled mortality rate within 36 months was 9.2% across the 5 studies. The NHANES study reported the highest percentage of participants who died (14.1%) while the lowest mortality was observed in the ARIC study (4.8%). 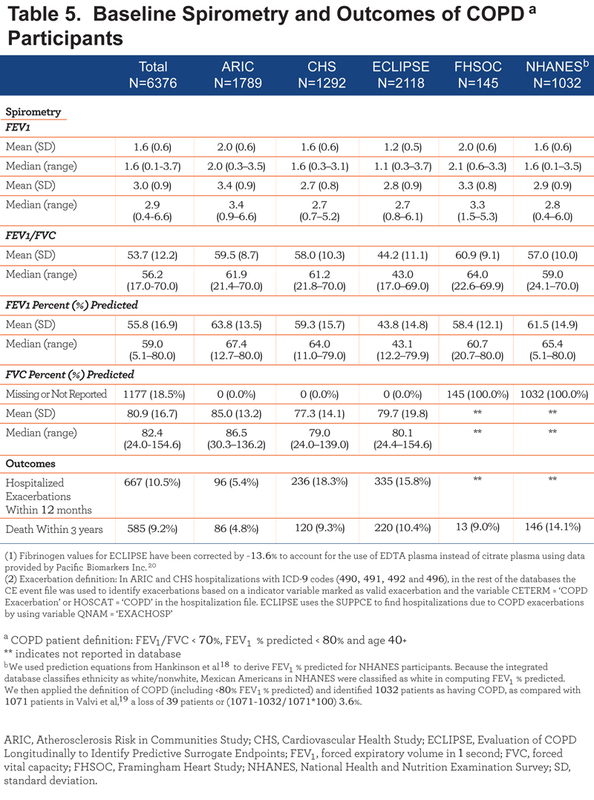 Complete details on baseline spirometry and outcomes in participants with COPD are depicted in Table 5. At a threshold of 350 mg/dL, 9.5% (266/2807) of participants with low fibrinogen in the ARIC, CHS, and ECLIPSE studies had a hospitalized exacerbation within 12 months, compared to 16.8% (401/2392) of patients with high fibrinogen. The percentage of participants with high fibrinogen who experienced a hospitalized exacerbation exceeded that of those with low fibrinogen in each study assessed. High fibrinogen was associated with an increased risk of hospitalized COPD exacerbations within 12 months (HR: 1.64; 95% CI: 1.39–1.93) among participants in these 3 studies. Figure 1 presents the Kaplan-Meier curves for time to hospitalized exacerbation for the integrated database. In the ECLIPSE study participants without a history of exacerbations, using a threshold of 350 mg/dL, 41.4% of individuals with low fibrinogen (164/396) had an exacerbation (moderate or hospitalized exacerbations) within 12 months, compared to 48.3% (347/718) with high fibrinogen. 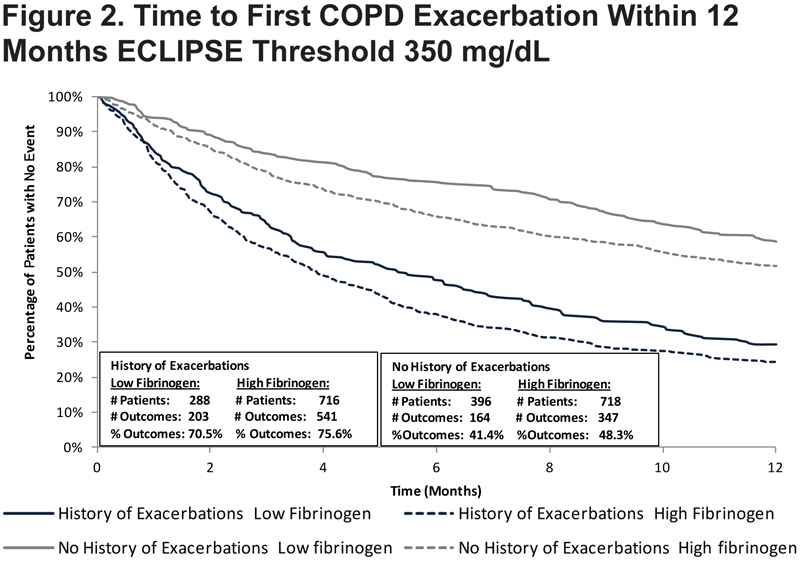 ECLIPSE participants with a history of 1 or more COPD exacerbations and high fibrinogen were at higher risk for another exacerbation of any type within 12 months when compared to participants with a history of exacerbations and low fibrinogen (75.6% vs. 70.5%). Kaplan-Meier curves reporting time to exacerbation in ECLIPSE patients are presented in Figure 2. 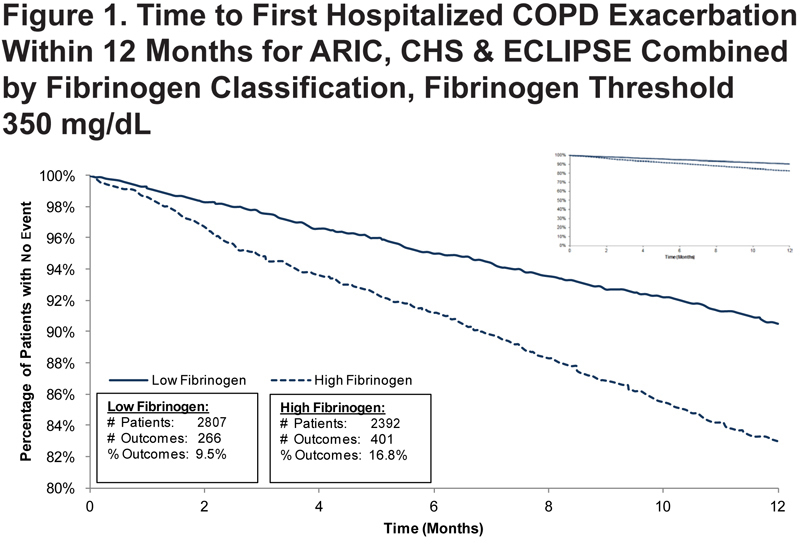 At a threshold of 350 mg/dL, 6.0% (213/3523) of participants with low fibrinogen in ARIC, CHS, ECLIPSE, FHSOC, and NHANES had died within 36 months of the baseline evaluation, compared to 13.0% (372/2853) of participants with high fibrinogen. High fibrinogen was associated with an increased risk of death within 36 months (HR: 1.94; 95% CI: 1.62–2.31) among all participants. Figure 3 presents the Kaplan-Meier curves plotting time to death for the integrated dataset at the 350 mg/dL fibrinogen threshold. An integrated analysis of participant-level data from 5 individual studies demonstrated that plasma fibrinogen ≥350 mg/dL was associated with an increased risk of subsequent hospitalized COPD exacerbations within 12 months and all-cause mortality within 36 months. As with any analysis of this type, there are strengths and limitations. The key strengths include: (1) a large, participant-level database comprising diverse studies, (2) the ability to integrate participant-level data allows an integrated analysis that is more powerful than could be achieved by analyzing the studies individually, (3) consistency in the distribution of plasma fibrinogen concentrations and the relationships to the key outcomes across the individual studies. 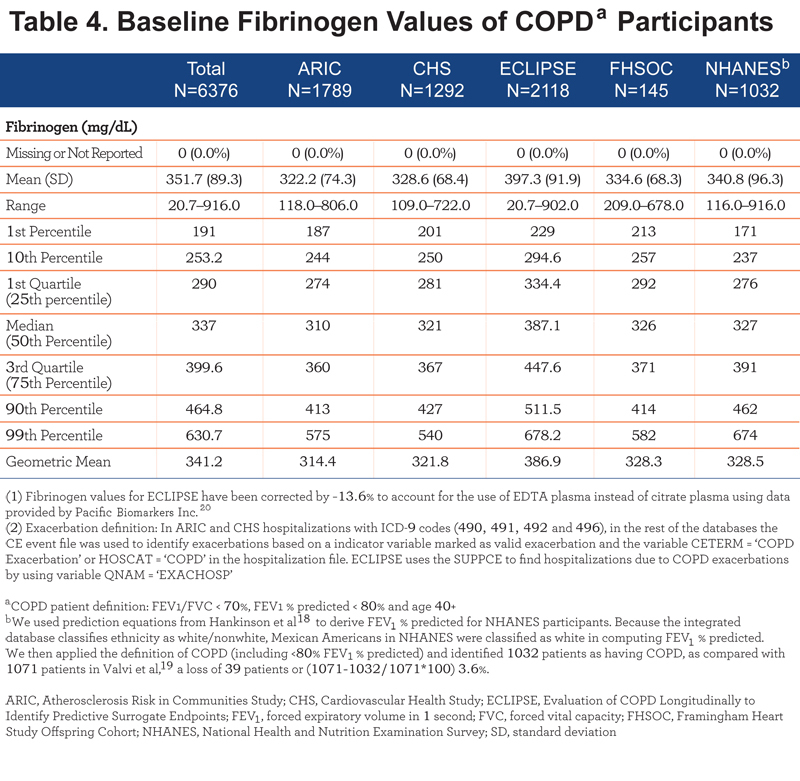 There are numerous limitations that include : (1) COPD was defined by pre-bronchodilator spirometry; however, comparison of pre- and post-bronchodilator spirometry in the ECLIPSE participants showed that misclassification did not appreciably bias the associations for fibrinogen, (2) the included participants were primarily GOLD stage II through GOLD stage IV, with the majority of participants being GOLD stage II, (3) COPD exacerbation events with a routinely used definition (e.g., new use of oral steroids and/or antibiotics or hospitalization) were only available in the ECLIPSE study; ICD codes from hospital records were used to capture information about COPD hospitalizations for the population-based studies hence the data supporting qualification for moderate COPD exacerbations is currently limited to a single observational study that demonstrated a limited reduction in sample size estimates relative to exacerbation history. However, recent large intervention studies highlighted the need for additional enrichment tools as all 3 studies included frequent exacerbators yet many participants did not experience the event.21-22 (4) Although biomarkers do not need to have biological relevance, it is unlikely that fibrinogen will directly affect COPD mortality or the hospitalized COPD exacerbations. Fibrinogen may, thus, be a biomarker for a generalized state of inflammation or a marker for polymorbidity that increases the chance that a small event (minor exacerbation) will lead to a worse outcome (hospitalization or death). (5) Two different means of assessing fibrinogen were used in this analysis (immunologic method and Clauss-based method). Although we used a conversion factor to make them similar, we do not have any directly comparative data available. (6) The strongest predictor of exacerbation is a prior history of exacerbation. This information was not available in most of the data sources, but should be available in clinical trials. (7) This paper presented data for a single threshold, 350 mg/dl. Additional thresholds are presented in the online supplement. Pharmaceutical companies, depending on the specific goals and population of their study, may want to have different thresholds. The CBQC believes the results support the use of plasma fibrinogen as a prognostic biomarker to facilitate enrollment of COPD participants at increased risk for all-cause mortality or a COPD exacerbation by enriching the clinical trial population with participants more likely to experience the clinical events of interest. All-cause mortality and COPD exacerbations are important clinical endpoints that are the focus of many COPD drug development programs. For clinical trial sponsors, participant enrichment can help make the conduct of such trials more efficient by reducing the total number of participants needed per arm, allowing the trial to be conducted in less time with a lower budget than would be required in a population that is not enriched. The benefit of enrichment/increased recruiting efficiency will be in facilitating the evaluation of these long-term outcomes earlier in the development path (Phase II). The degree of enrichment used should be dictated by the particular needs of a clinical program taking into consideration the ability to recruit the enriched population, the expected effect size, and whether there is a need to demonstrate the impact of the intervention being studied in participants without the prognostic biomarker. In addition, this biomarker may have a role in clinical decision-making apart from clinical trials. 2. Agusti A, Calverley PM, Celli B, et al. Characterisation of COPD heterogeneity in the ECLIPSE cohort. Respir Res. 2010;11:122. 7. Randomized, Double-blind, Placebo-controlled Study to Evaluate the Effect of Roflumilast on Endothelial Function in Patients With Chronic Obstructive Pulmonary Disease (REVASC). ClinicalTrials.gov Web site. http://clinicaltrials.gov/ct2/show/NCT01595750?term=NCT01595750&rank=1. Accessed July 30, 2014. 8. Losmapimod in Chronic Obstructive Pulmonary Disease Patients Stratified by Fibrinogen. (EVOLUTION). ClinicalTrials.gov Web site. http://clinicaltrials.gov/ct2/show/NCT01541852?term=fibrinogen+COPD&rank=1 Accessed July 30, 2014. 9. Investigation of Safety, Tolerability, Pharmacokinetics, Pharmacodynamics, and Clinical Efficacy of Oral Danirixin in Symptomatic COPD Subjects With Mild to Moderate Airflow Limitation at Risk for Exacerbations . ClinicalTrials.gov Web site. http://clinicaltrials.gov/ct2/show/NCT02130193?term=danirixin&rank=1 Accessed July 30, 2014. 11. Centers for Disease Control and Prevention,National Center for Health Statistics. Plan and operation of the Third National Health and Nutrition Examination Survey,1988-1994. Vital Health Stat 1. 1994;1(32):1-407. 14. The ARIC Investigators.The Atherosclerosis Risk in Communities (ARIC) Study: design and objectives. Am J Epidemiol. 1989;129(4):687-702. 20. Pacific Biomarker, Inc. http://www.pacbio.com. Data on file at GlaxoSmithKline..